NWSA SE Chapter held their annual Christmas Party at the home of LT Todd McDonald on December 6th. There was 23 members present. Our host set up a feast that beats none along with our members bring their favorites dish. Officers attending: LT Todd & Cheryl McDonald (President) and daughter Mya, AGC Steve & Cherry Turco (1st VP), AGC Bob & Charline Johnson (2nd VP) and daughter Teresa McGowens. List of members attending as shown in the photo: AGC Dave & Renee Carroll (1st time member, just recently moved from the hurricane damaged area of Mexico Beach and resettled in the Kings Bay, GA area), AGCM Marty & Bea Bonk, LT Fred & Lina Bergman, LCDR Eric & Loreta Gedult Von Jungerfeld, Salvatore & Susan Magaddino, AG2 Gerald & Sandy Burk, Chuck Bergman, AGC John & Carol Raley (1st time visiting; they traveled almost 300 miles from Augusta GA area and they hold the longest distance traveled). 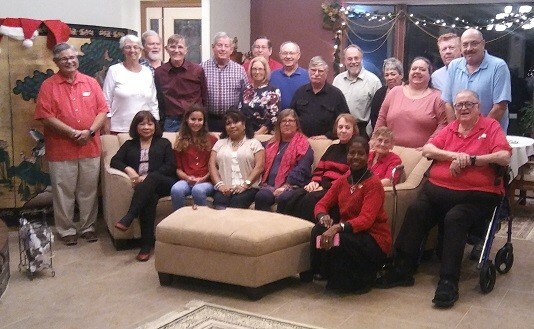 We conducted our winter meeting by starting with dinner at 1830 hours and following the passing out gifts and ending the party at 2115 hours. We noted that the new members present for the first time was Chief Carroll and Chief Raley. Chief Raley gave a briefing on his flight from the storm and moving into the Kings Bay area. He provided some details of the hardships for the people that were displaced by the storm, especially after losing everything you had to the storms. Other new member is Chief Dave & Renee Carroll. We welcome Master Chief Bonk back. They traveled with Chief Carroll from South Georgia. We were reminding everyone about the need for members to write up their history. And we provided information on the problems we were having with out auto-mailing on AOL and that we think it is about corrected at this time. Provided information on the spending from the Petty Cash funds showing $40 for the expense for the 1/2 page AD for the past reunion and that the 50/50 drawing results that keep the Petty Cash in balance. It provides for expense for the AD and our door prizes. We remain a group that collects no dues and plan on keeping it that way. We provided good news in that we no longer have to file the 990EZ, annual tax return. We now have the option of filing a brief report on the 990N form that will be sent out to us in the summer time via e-mail. With no additional business, we took a group photo that will be posted in the Aerograph and on Facebook. Each member will receive a copy via e-mail. Everyone had a great meal and time and it was fun talking with everyone about old times. Closed the meeting and dinner at 2115. 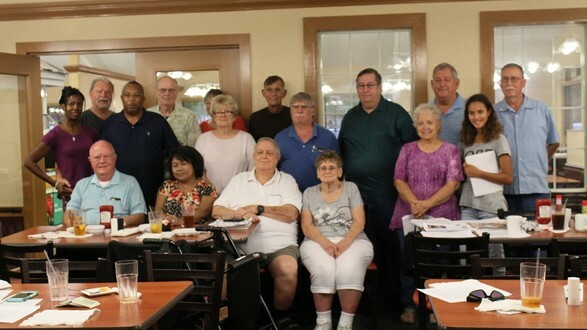 We held the meeting of NWSA SE CHAPTER at the Golden Corral Restaurant on 05/03/2018 at 7 p.m. It was a very slim turn out. We had several cancel out at the last minute because of various reasons, health, had to work, on a trip, but health was the largest reason. We do understand that health was very important and that is the most common due to the average age of our group. We had a great meal and we never called the meeting to order since that we had only 5 members present and there was 4 guest. We did discuss the Blue Angels problem recent in Florida and the news reports had reported that # 6 crashed. The truth was that # 6 was flying in formation with other Angels and it took a bird strike but landed safely with about 1 million dollars damage. News media did a number on this event. Looking back in history: 2016 September we had our Fall meeting and that night we had a hurricane & 2017 September we had another hurricane, but on this night (05/03/2018) it was a great night and we had great meal. We did receive the estimated date of our Christmas Party will be held at the home of our President on 12/6/2018. (Thursday evening). Details will follow later. Not sure if we will have a Fall meeting in September. We would like to thank Jane and Frank Andrews, Sal Magaddino and Bob and Charline Johnson as our regular member. Our guests were our family members our family.. Total attending were 9. We left the restaurant at about 08:15 p.m. 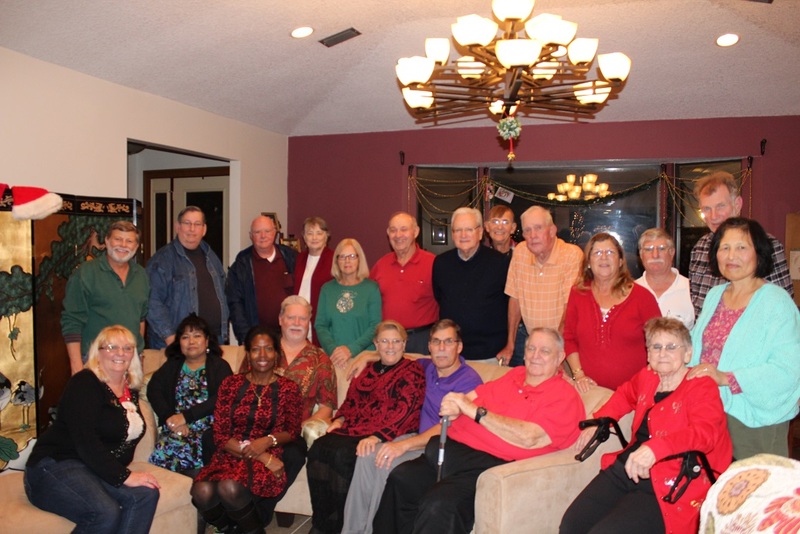 The NWSA SE Chapter held its Winter Meeting and Christmas Party at the home of our President LT Todd McDonald. Members present: LT Todd and Cheryl McDonald (President); AGCS Steve Turco (1st VP); AGC Bob and Charline Johnson (2nd VP); and AGCS Frank and Jane Andrews (Sect/Trea). AG1 (AD) Regina Perry (Liaison) unable to make it due to bad weather. The Christmas Party started at 1800 hours with a feast at 1830 hours. Following the feast of many special POT LUCK dishes. plus the feast the host had set up for the dinner. There was plenty for everyone and some left over. After the meal, we held the 50/50 give away with Jane Andrews the big winner again. Also gave out the door prize tickets. This year we had two great door prizes and we followed it up with our WHITE ELEPHANT (Re-gifting). It had to be the best WHITE ELEPHANT event we have ever had. Everyone seemed to be happy with their gifts. Very little trading going on. It was follow by our business meeting and photos. It was noted that most of our member were having some health issues for there were several that couldn't make it due to health issues. Since our last Christmas Party (2016), out ranks have become thinner: The loss of CDR Jerry STRUCK (one of our founding members of the Southeast Chapter); LCDR Bud PARHAM; and AGC Gary Titus had major surgery followed by extended stay in REHAB. The last time we heard from Chief Titus was a month ago and we haven't been able to make any contact with him or his family. A plead went out to our member hoping that we could find out some information be didn't have any luck. We covered the 2018 reunion in New Orleans, hoping that we would have several members at the reunion. We also reminded members that they should put together a history of their military service for the future and it could be saved by the Chapter. This was what LCDR Bud Parham did about 10 years ago. We wanted to tell our members that we do file a tax return (990ez) each year and if any one requests a copy in writing (e-mail or letter); we will provide them the most recent. We reminded members that our AEROGRAPH had a copy of renewal of Membership application in the back and if anyone needs a copy, contact the Chapter and we would ensure that they receive it. Also, we can provide copies of the SHIFT COLORS and if they attended the Lakehurst A of B Schools, we will attempt find a copy for them. They must provide the appx date of the Class GRAD or at least the year. We are still trying to obtain class photos from the years that the school was with the Air Force but no luck at this time. We had a new member AG2 Tom Berkeridge. He is going to get himself a new place in the Villages. We also had a member that hasn't been with us for some time, AGC Larry Cain. He is unable to drive and I told him that in the future, if he needs transportation to out meeting, he needs only to call the Chapter and we will get a driver for him. Reminded or members, we do not have dues and we pay our way by doing the 50/50 each year. We do pay for a page or half page in the Reunion book each year. We explained that we had problems with members address because we have AOL as out quick addresses for e-mail and tracking. They changed to AOL GOLD and it crashed more than 90% of a data base but we are slowly recovering. It any member knows of some Weather Types that we are not in contact with let me know their Name and Address. Since there was no additional business, we adjourned our meeting. Did our group photos and departed at 2130. We would like to thank Ms Tasha McGowens (my granddaughter) for her assistance in taking photos. We hope that we will be able to see everyone next year and a few more added. Members Present: AGC Sal & Susan Magaddine; AGCM Joe & Rhonda McGarr; AGC Sidney & Nancy Whitaker (visiting from VA); AGC Tina & Leo Sapp; AGC Larry Cain; LT Fred & Lina Bergman; AG2 Gerald & Sandra Burk; LT Todd & Cheryl McDonald; AGC Bob & Charline Johnson with guest Teresa McGowens and Tash McGowens; AGCS Steve Turco; AGCS Frank & Jane Andrews; Mrs Virginia Morgan and Berkley (granddaughter); AG2 Tom Berkeridge. Submitted by AGC Bob Johnson, SE FL Chapt. 2nd V.P. LT Todd McDonald and family, (President); AGCS Steve Turco, 1st VP; AGC Bob Johnson and several family members were present, 2nd VP, AGCS Frank Andrews (Sec/Trea) and Jane was present. Our liaison Regina Perry was not present due to pending storm. This was the second year that we were under the threat of a hurricane. Last year we had Matthew hit the Jacksonville area on the night of the meeting, and this time, we were under the threat of IRMA, a CAT 5 Hurricane heading our way. We had a great turn out: Our President TODD and CHERYL and daughter, AGC/AW Salvatore and Susan Magaddino, Mr. Chuck Bergman, LT Fred and Lina Bergman, AG1 Clarence and Antonaitt Grayson, AGCS Steve Turco (1st VP), AGCS Lloyd and Daisy Corbett, AGCM Joe McGarr, and AGC Bob and Charline Johnson (2nd VP), attending. We had another new member attending for the first time. They just moved from Columbia SC to Jacksonville and closed on a home just before the scheduled arrival of Hurricane IRMA – what a welcome. We welcome AGC Jim and Sandy Kilmer to Jacksonville. 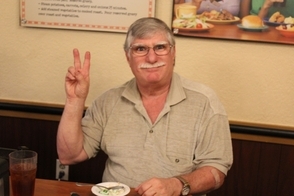 We had been in contact with Jim and Sandy for about 3 years when they started thinking of retiring in Jacksonville. He is a former member of the National Weather Service and Naval Weather Service. The first business: we wanted to advise our members that there would be a Christmas Party and all weather types would be welcome, but we would need to know in advance. It will be held again at LT TODD McDONALD's home on December 7th (Friday) at 1800 hours. We assisted in passing along information to correct an error in the Annual Oceanographer of the Navy Award (It was award related to the first AGC John Dungan Jr. AGCS Enrique Acosta Gonzalez received the award but there was an error in the information. It should be corrected in the next AEROGRAPH. We went over the information of the members that have passed away and importance of having details saved of their career and where to leave the OBIT or History of Weather Service career. We are collecting information saving it on the disk for family member if requested. We lost the following members this past year: AGC RAYMOND BIERLY, AGC GALE CAPLEY, LCDR BUD PARHAM. Other AGENDA ITEMS: We put up on display the following: The past 3 years of our tax return (990EZ), past AEROGRAPH, BELLINGER LIST, SHIFT COLORS, FRA Today. They were there if they would like to review them or, if they would like to have one, it would be sent to them upon request. Also, if they attended A or B School in Lakehurst, and if they would like photo of their class, send us a request and we would attempt locate it and send it to them. We provided blank copies for the form to apply for membership in the National NWSA, provided the location on the Web for Facebook and NWSA. If have problems, we will assist. We have been covering the cost for the search for OBITS of our former AG's and other weather types. We have had cut back on purchasing newspapers because of a very high increase in cost. Request each person to start looking in their newspapers for OBIT information and relay it to me. Or if they know of the passing of a weather type, get that information to us. This was very important recently with the passing of CDR RODNEY SALTS. He lived in Mississippi where there is few to no member being located. It was passed along to me and I was able to secure the information and it was passed along to the AEROGRAPH. Any information we receive helps. Following a group photo, we secured the meeting and left while we had great weather. We did know of several that decided to evacuate early. Roads were already full on Wednesday and it only was going to get worse. 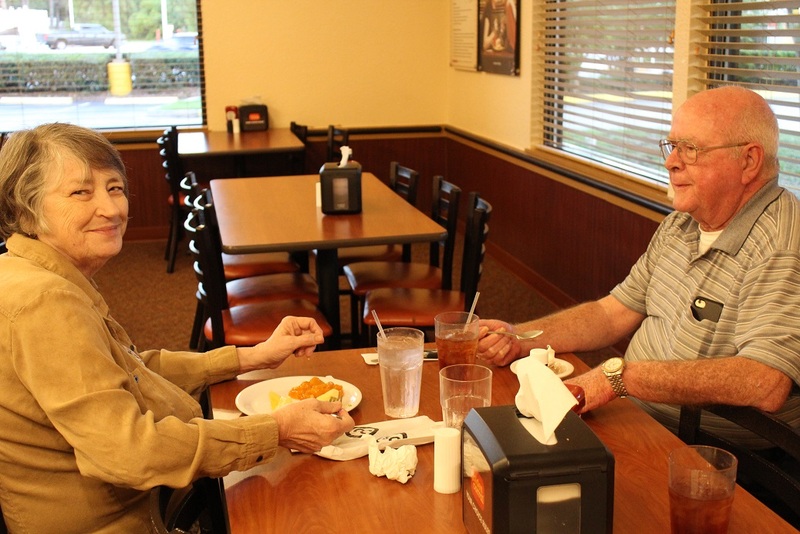 We would like to thank our host the Golden Corral for their great service. Other special guests were family members that joined us for a great dinner. We adjourned at 8:45 p.m.